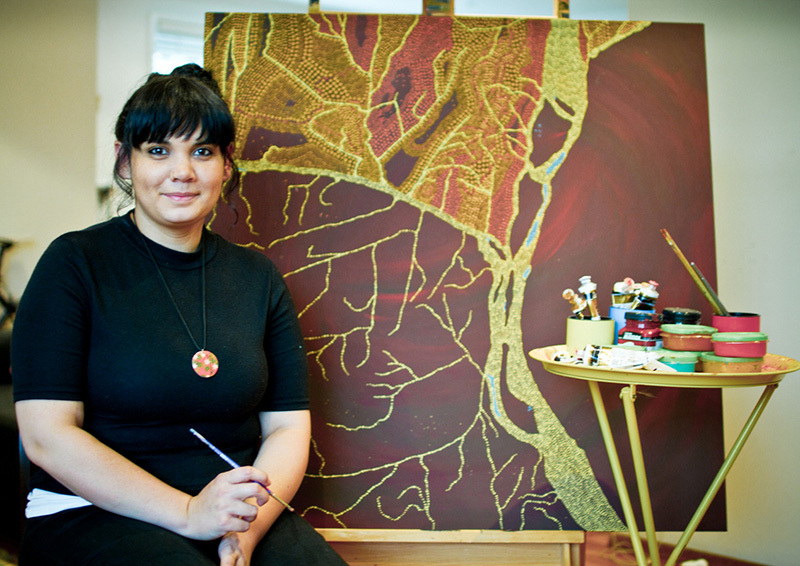 Arkeria Rose Armstrong, a vibrant young female Gamilaraay artist, was born in a small town in South Australia called Ceduna in 1988 to Stephanie and Robert Armstrong. Art has always been a part of Arkeria’s life. Her mum still has her childhood drawings in boxes under her bed as well as a few pictures framed and displayed in their family home. Arkeria now lives in Bendigo, Victoria with her partner and their daughter. Her middle name comes from her grandmother Rose Fernando who has since sadly passed away. Rose Fernando was a Gamilaraay Elder and one of the last sand painters in northern NSW and her special nickname for Arkeria was “Lilly-Rose”. She had a significant influence on Arkeria, both in her daily life and now years later in her art. Arkeria credits her grandmother and her mother for encouraging her to develop a strong connection to culture and a strong personal identity. Women are intrinsically linked to the stories portrayed in her artwork. Women telling stories, sharing ideas and knowledge is what Arkeria has known all her life and this can be seen in her art. From the age of 7 to 18 years Arkeria travelled and lived in outback Australia with her family due to her father’s job as a gold prospector. “Having the time to learn in quiet spaces in some of Australia’s most picturesque country was a blessing”, Arkeria says of the experience. She credits the experience with giving the strength to be able to focus on her inner feeling so that she can express the heartache of losing her grandmother within her paintings as well as painting paintings that express her own sense of self. It is her connections and feelings of intertwined stories that can be seen within the lines, strokes and dots layered on the canvas. 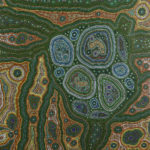 Painting with acrylic on canvas allows her to use a range of colours which represents her Country and the stories and knowledge. Her grandfather, Don Briggs a Yorta Yorta Elder is another person who strongly influences her. Don Briggs who is also an artist and he has taken on a mentor role with her as well as supporting her to have confidence to paint “her way”. Her grandfather lives just an hour away. She hopes that people like what she does and that she loves how art has allowed her to express herself, and believes art is a healing force that connects past and present.